I love, love, love holiday sugar cookies (with frosting please!). 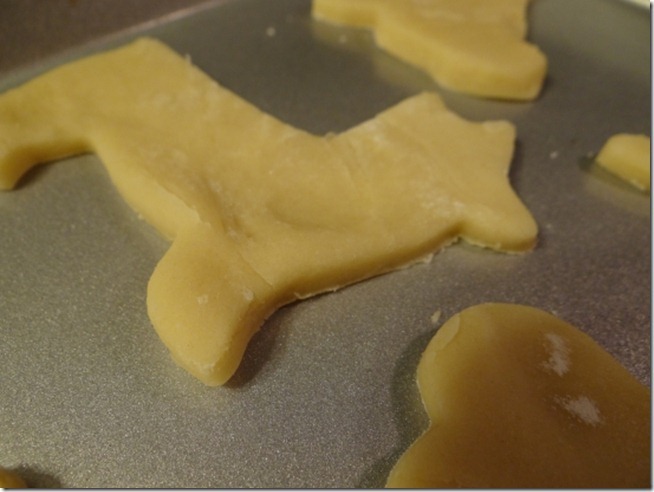 Of course I also love corgis, so I got creative and bought a corgi cookie cutter to make pembroke corgi cookies. 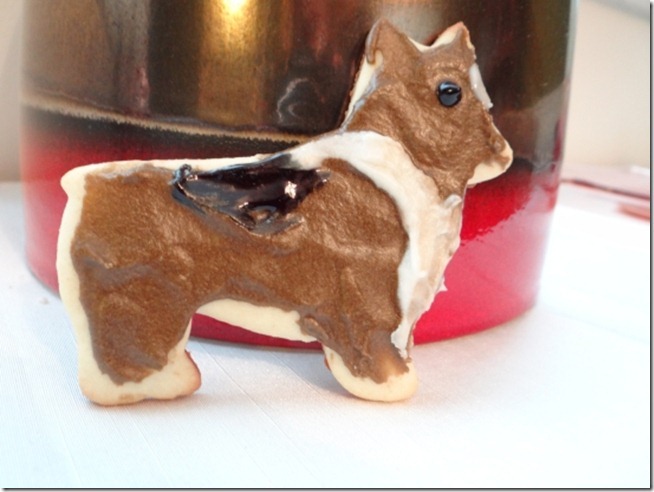 I bought the Welsh corgi cutter from Good Dog Express ($5.49) and used a basic sugar cookie recipe from All Recipes. Cream together butter and sugar in a large bowl until smooth. Beat in eggs and vanilla. Stir in flour, baking powder, and salt. Cover and chill the dough for at least an hour. Preheat oven to 400 degrees F (200 degrees C). Roll out dough on a floured surface 1/4 to 1/2 inch thick (I find it helpful to flour the ball of dough first too). Cut into shapes with cookie cutter(s). Place cookies 1 inch apart on ungreased cookie sheets and bake for 6 to 8 minutes (It took only 6 minutes for me). I doubled the below recipe, which was also from All Recipes. Combine confectioners’ sugar, butter, vanilla and milk, and beat until creamy. Thin with a few more drops of milk to reach desired spreading consistency. I had to add several more tablespoons of milk to get the frosting to the consistency that I desired. For color, I split up the frosting into smaller bowls, and used a combination of green, red, and yellow food color to make brown frosting. There is no specific amount of drops to add of each color. Instead, you must play around with it a bit and experiment to get the shade that you want. 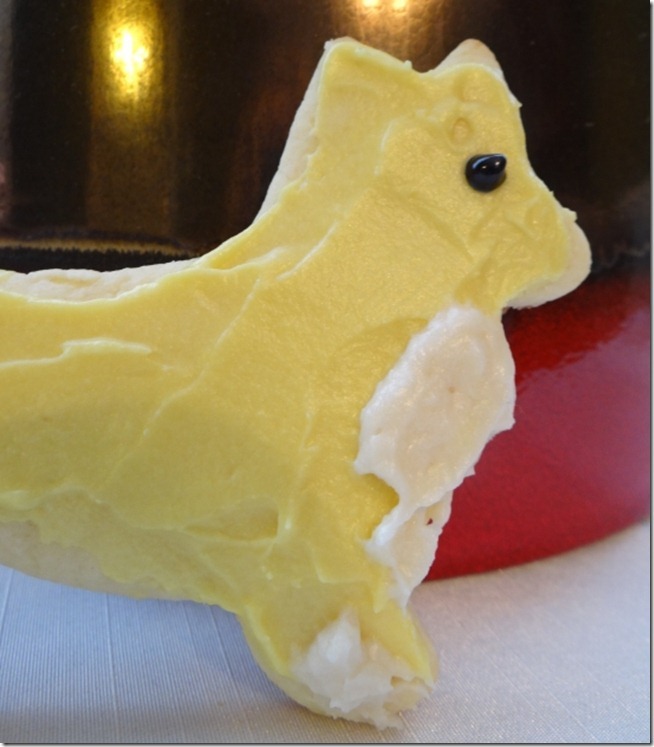 I also made a pale yellow frosting for yellow corgis and I left some of the frosting white. For black, I bought a premade black decorating gel frosting. 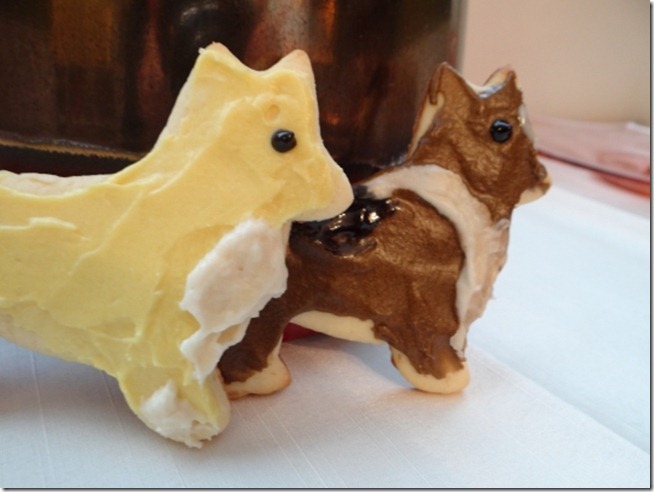 I made half of the cookies in a tri-color look of brown, white, and black to look like my corgi Ty, and half in yellow frosting to look like Eve. I’m not the most artistic person around, but I think they still came out cute. These were really fun to make and tasted great! Although I had a hard time bringing myself to actually eat little mini versions of my dogs! Good Dog Express has cookie cutters in multiple dog breeds and for cats, so you can make cookies to resemble your own pets. They also have other shapes like paw prints, bones, and dog houses.